There is a wide variety of acupressure styles available. Each type of acupressure has unique and distinctive characteristics. Even though they all use the same points they vary in terms of how a point is held and for how long. Claire Murphy offers Oil Massage with Acupressure, Zen Shiatsu, Jin Shin Acupressure, Reflexology with Acupressure and Thai Foot Massage. The Face Lift Massage also incorporates important acupressure points on the face. Acupressure is ideally suited for self-help. Many acupressure points are within a person’s reach and take a minimal amount of time for proper location and pressure. During an acupressure session at the Centre you will be shown how to stimulate points on your own body so that you can take responsibility for your own health maintenance. Jin Shin Acupressure uses the same points as acupuncture, but uses thumbs or fingertips to balance and release the points instead of needles. Both hands are used to hold various combinations of acupressure points, selected by the practitioner to suit the individual’s needs. The practitioner focuses on the acupressure points being held and channels energy into them to aid release of the muscular tension and energy blockages. Using both hands to hold two or more points at once achieves greater balance and harmony in the body. The points may be held from several seconds to a few minutes depending upon the person’s requirements. By releasing the blockages that accumulate around the points, Jin Shin opens the circulation of chi energy. To discover how the energies are flowing in your body, the practitioner will feel your pulses on both wrists, noting their quality, rhythm and strength. They may also look at the structure, colour and coating of your tongue to give a good indication of your physical health. The aim is to discover which energy channels need adjusting for your specific complaint to improve, and which require treatment to boost your overall energy and vitality. Some people are energised by the treatment, while others feel relaxed and calm. If the treatment has been particularly strong you could feel quite tired or drowsy for a few hours, and you should take this into account if you are planning to drive or use machinery. Occasionally there may be a short-term flair-up of your symptoms as your chi clears and resettles itself. Shiatsu is a Japanese acupressure technique for structural integration and muscular tension release. The word Shiatsu literally means “finger pressure”. Zen Shiatsu is an integrated style of Shiatsu that uses hands and elbows as well as thumbs to stimulate points and release tension in the neck, shoulders, back, legs, and face. Rhythmic pressure is maintained throughout the shiatsu treatment. Areas of the body are pressed firmly for three to five seconds. The consistent steady rhythm provides a harmonious and balancing effect on the body. If there is pain involved it should “hurt good”. 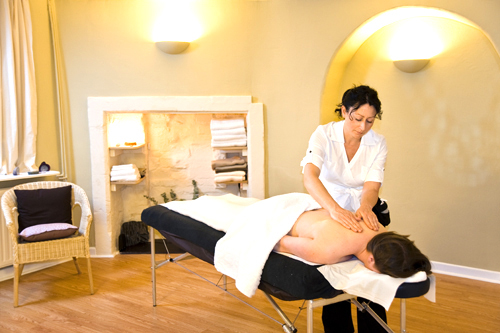 The massage also incorporates body stretches making it complimentary to Thai massage. Zen Shiatsu is great for balancing the body, improving circulation and releasing muscular tension. It is especially suitable for people who suffer from painful muscular tension in their neck, shoulders, back and legs. The direct pressure releases excess lactic acid that causes muscular problems. Shiatsu techniques are designed specifically to stimulate acupressure points and meridians, and thereby benefit the whole body. The shiatsu massage is received on a mattress on the floor. Please wear loose comfortable clothing for this treatment, and avoid eating a meal 1-2 hours prior to the session. Foot massage has been used for more than 3000 years to prevent and cure many conditions. On each foot there are areas known as reflex points relating to each and every organ and body part. Nerves connect the reflex points to the organs and body parts. By massaging the reflex points you can stimulate the activity of the internal organ or body part and promote healing and improve well-being. Foot massage can be effective at treating a wide range of conditions such as: headaches and migraines, digestive problems, asthma and urinary problems. The benefits of Thai Foot Massage include improved circulation and toxin removal, stimulated lymphatic drainage and immune system boost, accelerated physical healing and stress relief. Specifically, it is especially effective at treating migraines, PMS and water retention in the legs and ankles. The benefits of Reflexology with Acupressure include improved circulation so that toxins held in the body can be released, benefiting the blood, organs, glands and nerves. It is also an effective way of indirectly healing problem areas in the body. From experience, it can be used to aid fertility by stimulating the reproductive organs, and reduce water retention and back pain in the later stages of pregnancy.